Please welcome Jessica Leigh Smith to the blog today! Jessica is an Atlanta-based actor and Mom, who has co-starred on One Tree Hill and Drop Dead Diva (both times while pregnant! you go, girl!). 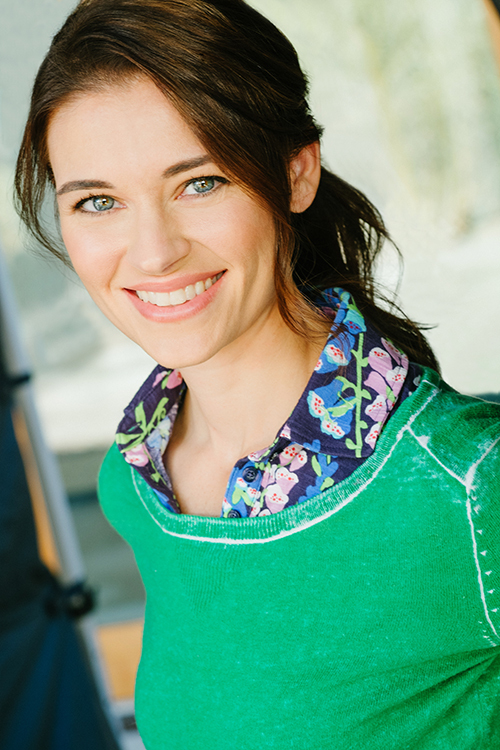 She shared some of her actor-mom wisdom in our post on the subject, and is back to talk self-producing, as she’s recently launched her own web series called Alyssa’s Tips for Easy Parenting. Check out her self-producing wisdom and her awesome web series! We’re a good 10 years into the concept of self-producing your own web series. And actors have been self-producing since the dawn of Hollywood (check out the origins of United Artists for a classic example). What could I possibly add to the discussion? Honestly, all I can really add is my own experience. But I hope that my personal story of how my show came to be will inspire you to get yours off and running. I was pumped, so I brainstormed with a friend on what we could do together. We created a new take on the odd couple theme set in a faux reality a la The Office, with a surprise ending. Shortly after this we wrote another series with three other friends. It was five episodes with each featuring a different one of us, so that each of us got to shine. Both series were comedies that showcased each actress in her type, what each actress could do in her most natural role. Then two of the actresses left the business and I started another side production called pregnancy! I had big plans for my pregnancy—don’t lose momentum and come back strong. However, I developed hyperemesis, which means I had extreme morning sickness every second I was awake for the entire pregnancy. Not much was accomplished. Cut to fall of 2009 and I now had an infant. I went right back into career mode, but this time I didn’t have a series written, and no buddies to work with. I decided I needed to find a show produced by someone else. I was cast in a web series in 2010 that turned out to be a mistake. During this time, my career was growing. I didn’t need my own self-produced work, right? If the whole point was to do work that would get me noticed, then I was doing okay (please note the sarcasm). Truthfully, I believed self-producing to be important, but it wasn’t high priority. 2012 started with hyperemesis (again!) and ended with another infant. Again, my thought was to get right back to work–never to be slowed down. And I wasn’t, for about the first six months of 2013. But then something completely unexpected happened—I hit a dry spell. Even as I contemplated quitting, my brain kept on churning. I just couldn’t shut it off! Ideas poured out of me. I’ve always had some good ideas floating around, but this was getting insane. And it all happened where it usually happens—in the shower. One morning I was in the shower, and for the umpteenth time, I was trying to decide what type of web series I could do for myself. Wait, that isn’t true. I was really whining about all the obstacles I had in shooting a web series. You know, so-and-so gets to do a great series because he has friends in production who will work for free. THAT girl doesn’t have kids taking up all of her time. I can’t write! Wah, wah, wah. But this time, I finally told myself to shut up. I was going to quit whining about my obstacles and find a way around them. That’s when I decided I had to find a series I could do on my own, from my home, for free. Tall order, I know. Suddenly, I realized I could do something like that! Obstacles of no money and no time? Conquered! I could simply set myself up in a vlog type format! I still didn’t know what the show would be about. But I knew that my most obvious “type”, by far, is Mom. Any mom role, bring it on. But still, what would the show say? You may have noticed that there is a hot button topic out there called Mommy Wars. Apparently too many mommies out there are telling everyone else how to be a mommy, and everyone is getting their diapers in a wad over it. The internet has spawned countless mommy bloggers and YouTube has its equal share of mommy vloggers. I love sarcasm and I love biting humor. I decided my show could actually say something by speaking to this subculture of mommies and their in-fighting. And that is how Alyssa’s Tips for Easy Parenting was born. It turned out I could write little monologues in my own voice on a topic with which I was intimately familiar. Obstacle of no writer? Conquered. Alyssa considers herself to be a perfect mommy and she never tires of trying to help others be perfect mommies as well, by telling them exactly how she does everything so that they can follow her example. She is naïve to her own ignorance and therefore her condescension to others. At the same time, you just can’t help but love her. What does this show say? I am hoping to shed some light on why we shouldn’t be involved in these Mommy Wars. There is no perfect parenting and we’re all just winging it anyway. It’s a lesson for myself as much as for anyone. I mean, let’s face it, Alyssa is just an extension of Jessica. And everything I wrote came from something that was said to me or from something I had said to someone else. During the process, I learned of one other obstacle I had let get in the way. I thought whatever I did had to win an Emmy for best web series before I could release it. But there is definitely something to be said about filming something, anything often and then throwing it out there to see what sticks. Alyssa’s Tips for Easy Parenting won win awards for quality. But I got it done. It’s there for the world to see. And that is empowering for me as I think about the next one. Because, you better believe it, there will be a next one. Thank you so much for sharing your thoughts on self-producing, Jessica! Love the series. Follow Jessica on twitter at @JessiLeighSmith for more insight and interaction!